"It's a dangerous business going out of your door. You step onto the road, and if you don't keep your feet, there is no knowing where you might be swept off to." 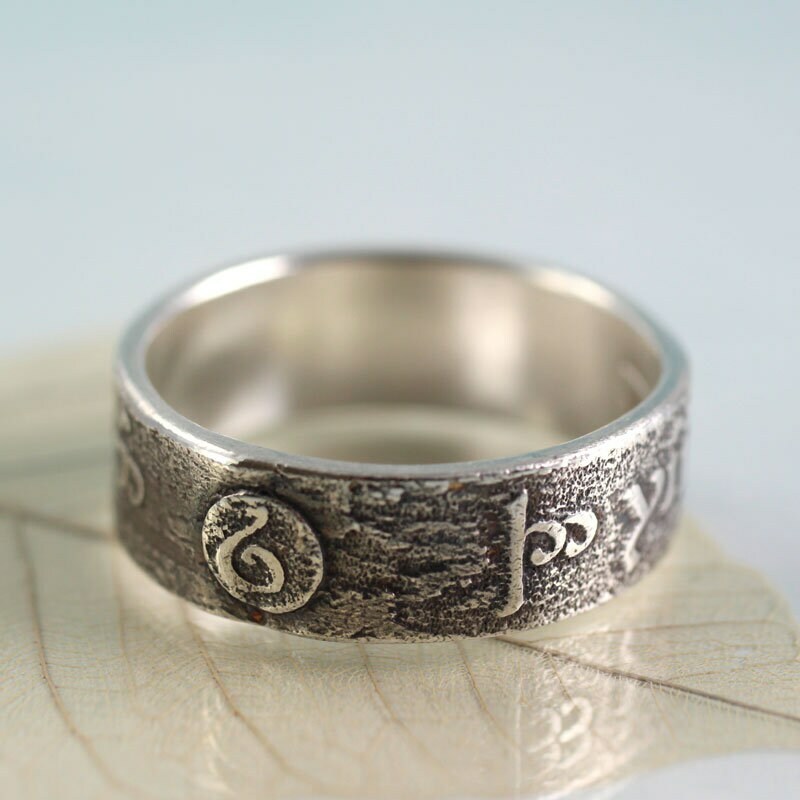 Here is a ring for anyone who loves tales of Elves, halflings and fantasy adventures. It would make a beautiful timeless wedding ring. 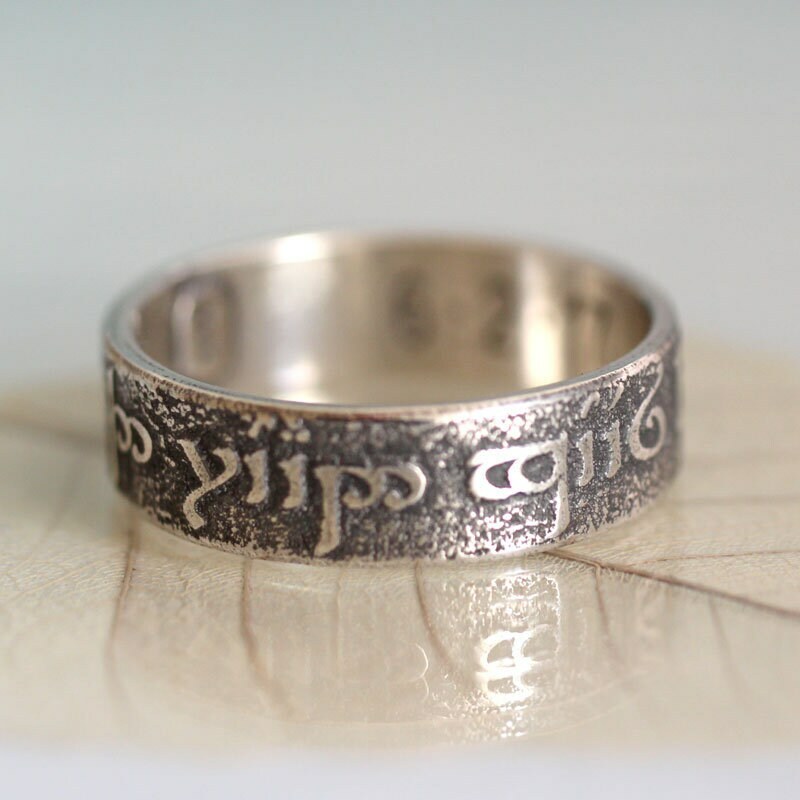 Relic ring inscribed in Feanorian characters, the text is: "The road goes ever on and on". Phonetic English transcribed into Elvish characters. 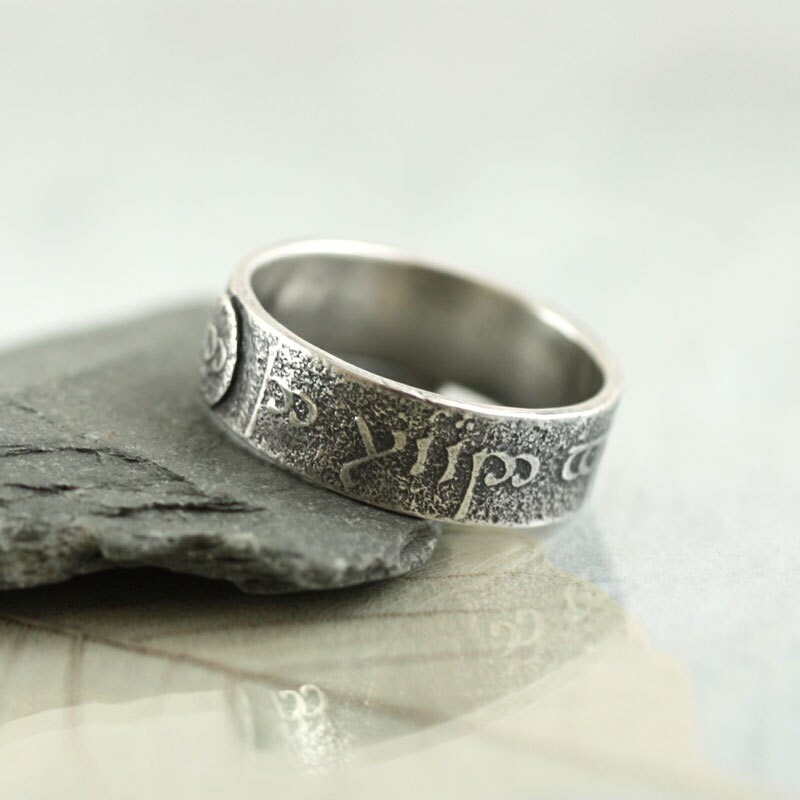 It is a sterling silver band 5-6 mm wide - rustic, hand-shaped and oxidised to emphasise the runic calligraphy. The letters shimmer on the darker background. 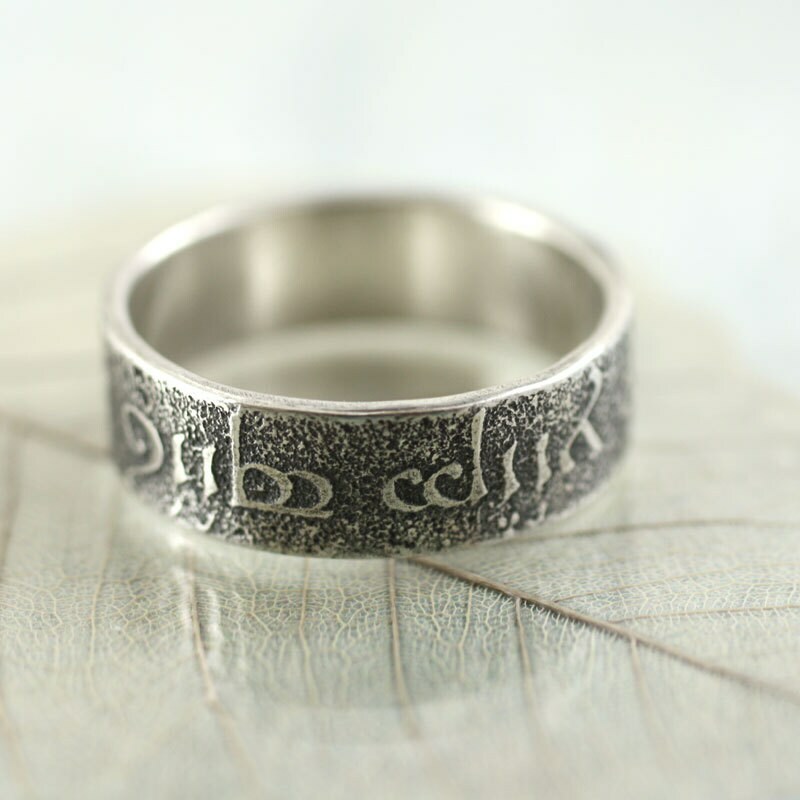 Polished to a high shine and subtly adorned with a round rune plaque to finish the design. Made to order in all ring sizes. If you don't know your US or UK size, I suggest getting it measured properly or ordering one of my ring sizers. Also let me know your inscription if you have chosen one in the drop down menu. This is completely optional as an extra. 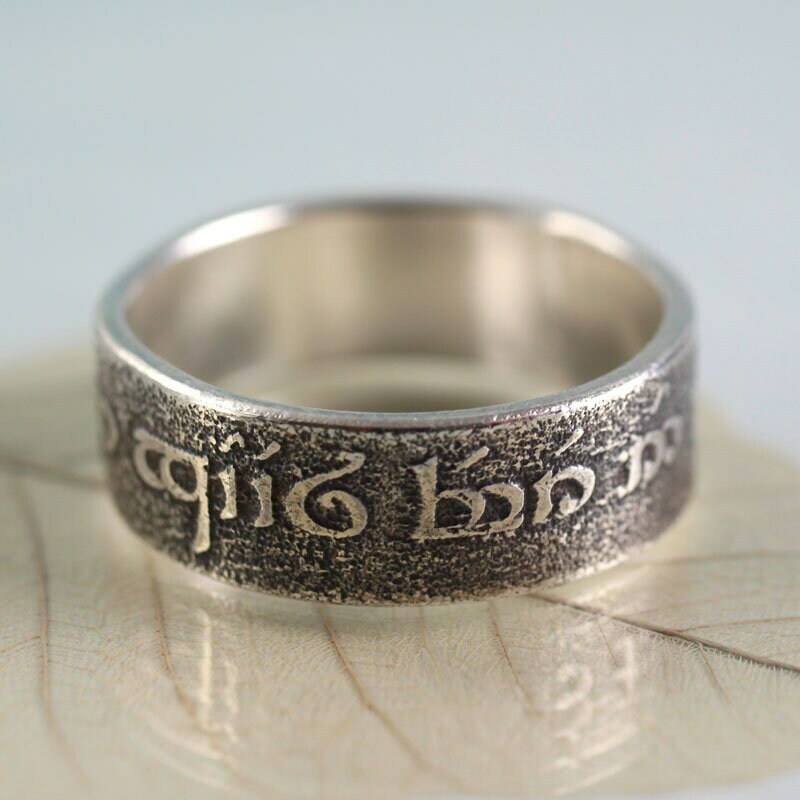 Do note that a custom inscription means that the ring can't be returned for a refund. I accept credit and debit card payments via PayPal. You do not need an account with them to use this service. I ask for up front payment for everything, including custom orders. .I use Royal mails First Class within the UK and International Airmail option everywhere else for any item costing less than £45. It is cheap and keeps the cost down for my customers. This means that your item is not tracked or insured. If you want that extra safety and to be able to follow your goods, PLEASE use the shipping upgrade option at check out. For more expensive items you will automatically pay for a tracking service which is insured for £50. .Delivery times vary depending on your location and your country's security & customs policy. Once shipped, please allow 2-3 working days for delivery to the UK, 7 days to Europe, and 7-28 days to USA and Canada. .I'm afraid I don't ship to the rest of the world as there are too many uncertainties and restrictions on what I am allowed to send via normal post. If you are from another part of the world and willing to pay for a courier to get your items, please get in touch and I will work out what that might cost for you. .Customers are responsible for additional costs, such as customs, duties, VAT, taxes, etc. Since customs policies vary widely from country to country, we urge our international customers to contact their local customs office for an estimate before ordering. If for any reason you would like a refund or exchange, or if you wish to return an item, please email within 14 days of receiving the item. Please state the reason for the return in the body of the email. Please note that jewellery made to order with initials, words or similar specific to you cannot be returned (unless the item is faulty). Goods must be returned directly to me in protective/adequate packaging. The item must arrive with me in perfect condition. Postage costs for returned items are at your expense (unless the item is faulty), and I am not responsible for goods lost or damaged in transit. In the event of an item being faulty or damaged, you should notify me in the first instance before posting the item back. I will then send you a new item or make you a full refund at no cost to you. A cancellation form can be provided at your request. As a resident of UK I fully adhere to the EU regulations laid down on Distance Selling. The majority of the jewellery I make uses sterling silver components unless otherwise stated in the description. 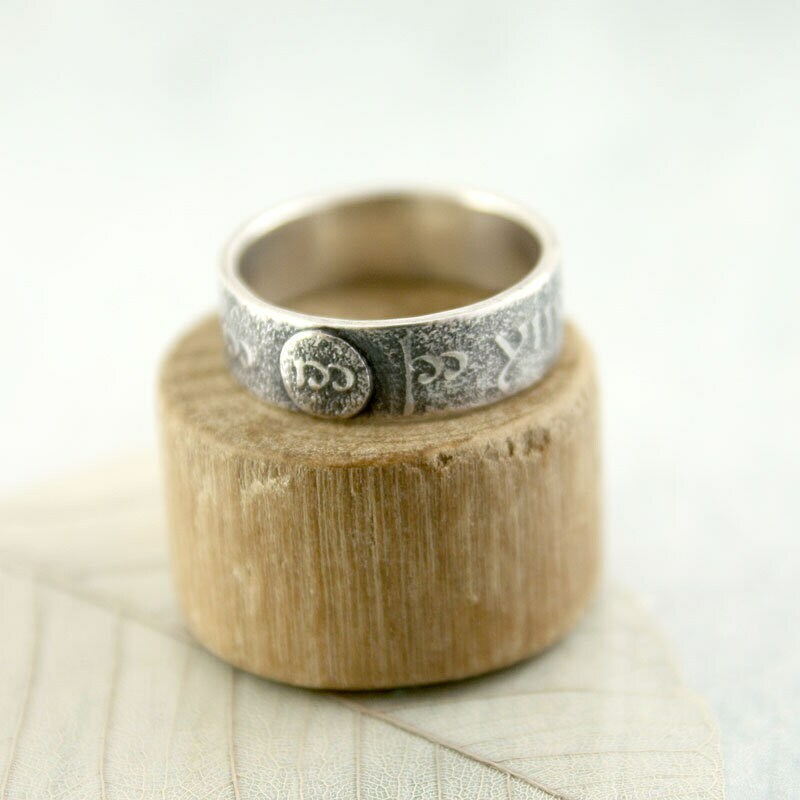 In accordance with UK law (The Hallmarking Act 1973), if the total metal weight of the jewellery is below 7.78g there is no requirement for the sterling silver component to be hallmarked by an Assay Office. The vast majority of the jewellery items I sell falls within this category. 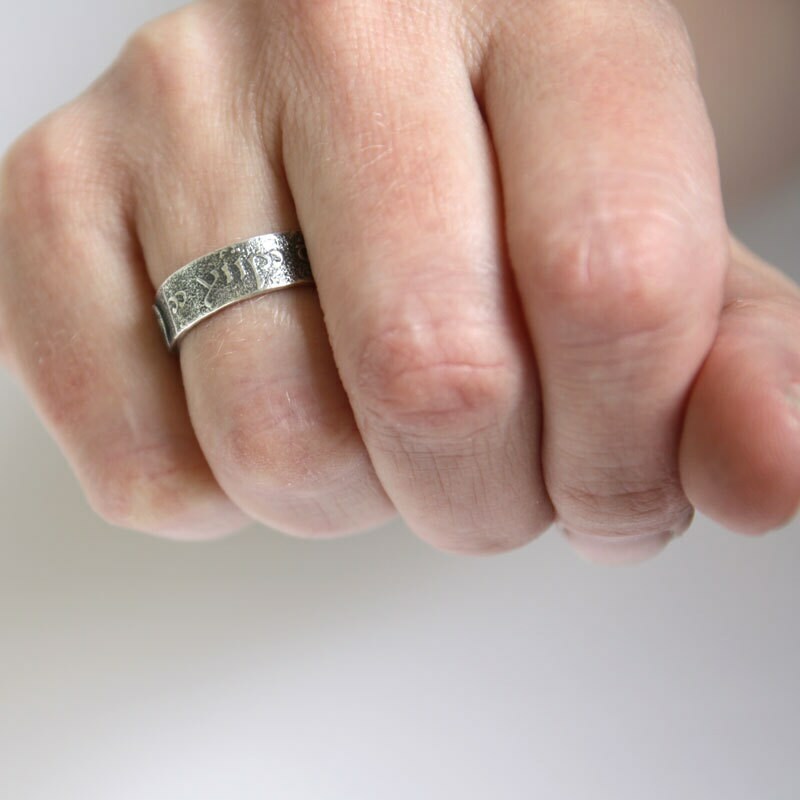 I have therefore opted not to hallmark these items in order to be able to bring you personalised jewellery at the best possible price - so you don't have to pay for hallmarking that is not required. This does not in any way lower the standards or quality of the items I sell - and the majority will be stamped 925 for sterling silver. It's exactly the same material, it just hasn't been assayed. 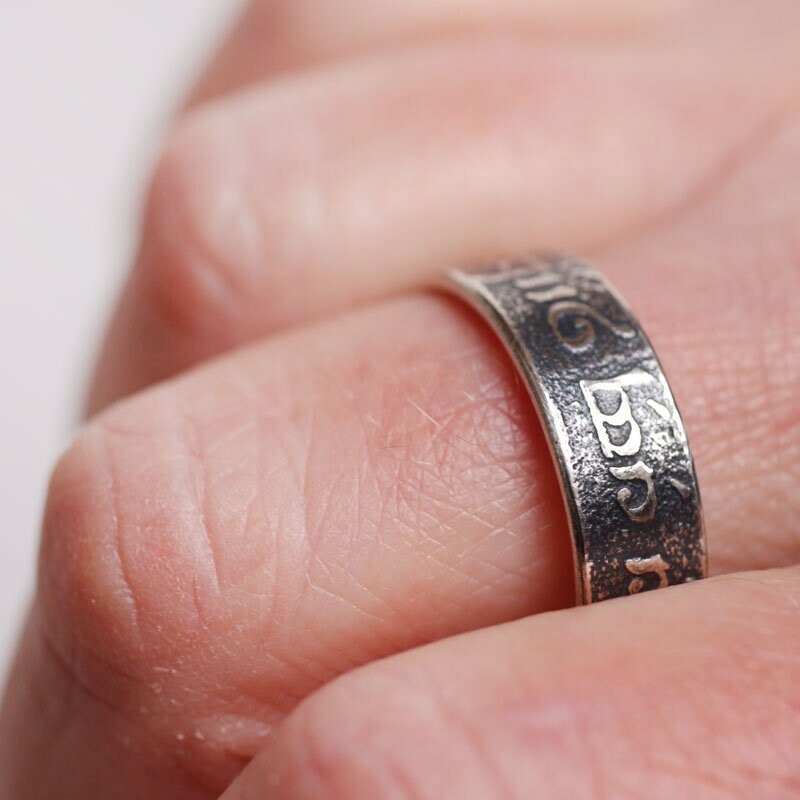 Every item advertised which weighs more than 7.78g is hallmarked by Sheffield Assay Office as an additional guarantee to you of the purity of materials used. This service is included within the item price you pay for your personalised jewellery. Unfortunately having an item assayed can take several weeks longer than un-tested items, as it is out of my hands when with the assay office. However, I'll do my best to get your jewellery to you as soon as possible. Only to fulfil your order and provide the best customer service that I can. I share information about you only with courier and postal services, and then only as much as they need - i.e. your address. I do not save your data privately. The data is retained only here on Etsy as a record of transaction. If Etsy deletes the data it is lost to me too. You may have the right to access and receive a copy of the personal information I hold about you by contacting me using the contact information below. Change, restrict, delete. You may also have rights to change, restrict my use of, or delete your personal information. This is best done by contacting Etsy directly as I have no access to your personal account - nor can I delete the information held. I had eyed this ring for ages and asked Nana multiple questions about it before buying. Nana was always so kind and helpful. The ring is beautiful and I'm so pleased with it. Highly recommended shop and seller! 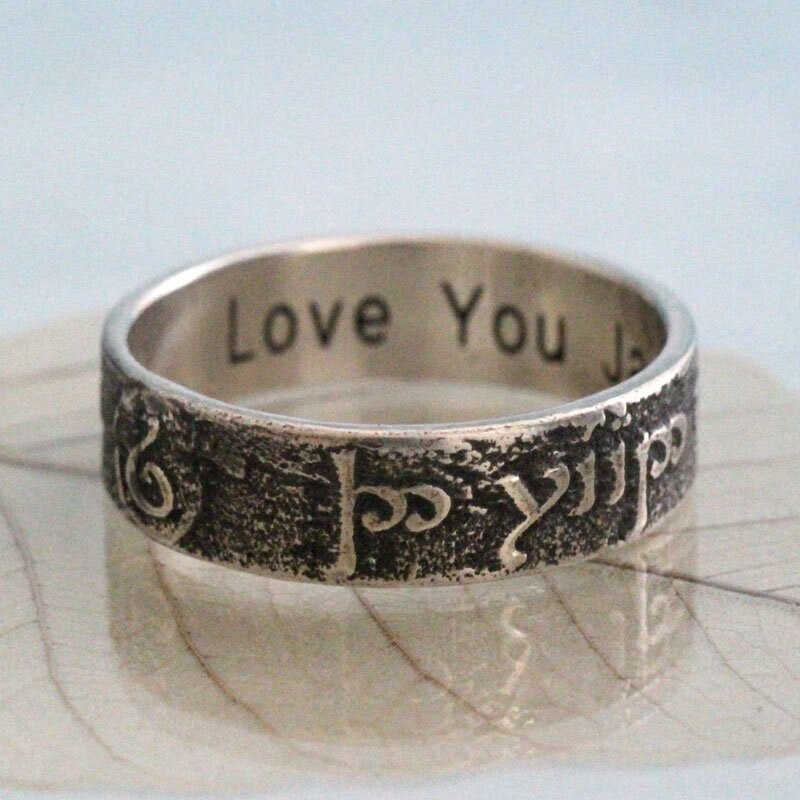 A wonderfully beautifully made ring with incredible support from Nan. She communicated really well throughout the process and she patiently answered my questions. Fingers crossed (hah!) that it fits well as it is a surprise! 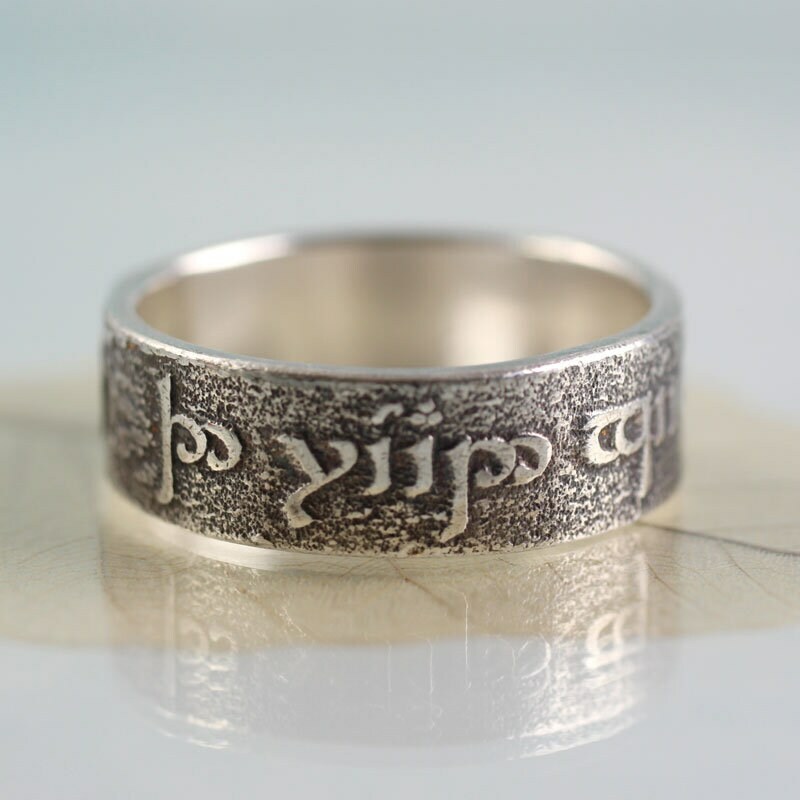 The ring is awesome, it is of excellent quality and perfectly finished. Totally love it!!! Nana (the maker) is always really kind and helpful in following you to chose the best solution. Glad to have met this great handmaker and artist. I love it! comfortable, gorgeous and arrived very quickly. Absolute fan of Nana :) Thank you!